When people talk about Mazda’s 13B twin-rotor Wankel engine, they tend to imagine lowered, twin-turbocharged FD RX-7s with giant wings and huge front splitters. But that 13B engine doesn’t get nearly enough credit for powering what has to be the greatest little bus of all time: the Parkway Rotary 26. The engine in the Parkway Rotary 26 is admittedly not quite the same as the 13B-REW found in those tricked-out FDs you keep lusting after, but it’s the same basic, legendary architecture: essentially a lengthened 12A engine with two 654 cubic-centimeter chambers. Though most folks know the 13B started out life in the early 1970s under the hoods of cars like the RX-4 (called the Luce in Japan) and RX-5 (called the Cosmo AP in Japan), many don’t realize that Mazda shoved that motor into a little bus. A luxury little bus. 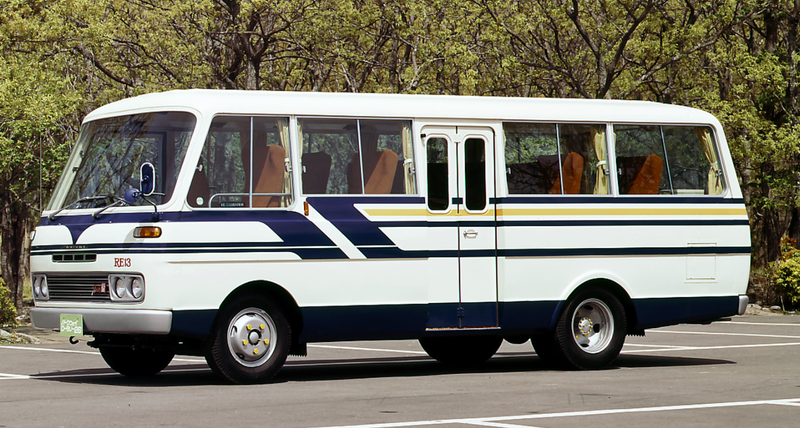 Then, in 1965, Mazda Launched a 25-seater called the Light Bus Type-A, a weird-looking bus with a rounded front end and vertical sides with giant rectangular windows (you can see a picture of that madness above). Mazda’s Type C, which came at about the same time as the Type A, was similarly weird and awesome, but the crown jewel of Mazda’s bus line was undoubtedly the Parkway 26 shown in the top photo. That bus, apparently a response to demand for “upscale minibuses” in Japan, stepped Mazda’s bus game to a whole new level. Mazda’s legendary 13b rotary engine. The Parkway 26 could be had with a number of engine options, including a 2.0-liter 91 horsepower inline-four, a 2.5-liter 76 horsepower diesel four pot, and a 2.7-liter 80 horsepower four-cylinder diesel. All of those engines are irrelevant though, because in 1974, Mazda showed the world the first “low emission” rotary bus ever, the Parkway Rotary 26, equipped with the legendary 13B tuned to make just under 135 horsepower. For an over 7,000 pound bus, that wasn’t a lot of grunt, but it got the vehicle up to over 70 mph—impressive performance for the time. The point of the engine in this application—tucked under the floor between the driver and passenger front seats—really wasn’t so much speed, though. It was luxury, as the motor proved to be smooth and quiet. A website devoted to Japanese cars, Japanesenostalgiccars.com, also says that there was a 1.0-liter piston engine in the back powering an optional air conditioner, and that only 44 of the rotary-buses were ever made, making this high-revving, smooth five-speed people-hauler not just the coolest bus ever made by a mainstream car manufacturer, but also one of the rarest.